Tavarua. A place where the waves pump and the and the people are friendly. Nestled comfortably in the Fijian chains, this little heart shaped island is one of the most desired surf trips one can take. Andrew Bennett and I embarked there last month to meet an angry purple blob spiraling off the coast of Tasmania. He had been acquainted with the island for many years, but this was my first time. We arrived two days before the swell and made ourselves comfortable. The interval in the swell was shorter the day we got there, which meant Restaurants was breaking. We watched as we ate lunch. Empty lines peeling for a quarter mile in front of us. Lunch ended rather quickly and we were on the next boat out. "George Greenough shaped this 6'3 edge bottom space ship and was nice enough to let me test it out. I have never felt the kind of speed and wild hydrofoiling that this thing did. What our elders know through their direct surfing experiences needs to be respected and passed on in some way, their wisdom is priceless." And with that, Andrew, Rasta and myself loaded the boat bound for Cloudbreak. It was Sunday evening and the swell was starting to show its teeth. Monday quickly arrived as did the swell we were anticipating. Everyone was up in the dark pacing around the coffee machine talking about what they reckon the conditions are like. It was big – really big. By 7am there must have been fifteen boats out in the channel, mainly to watch. Everyone got a piece of the swell and came in grinning from ear-to-ear at the end of the day. It was a pretty magical day. 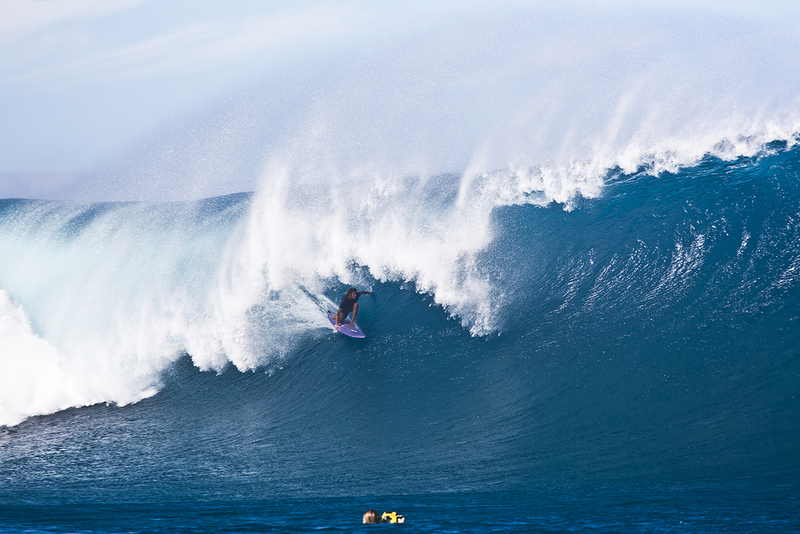 Andrew and I stuck around until Thursday to get some uncrowded remains at Cloudbreak. Checkout time was 5pm and at 4pm we noticed another storm system making its way toward us. After (kind of) jokingly flipping a coin, we decided to stay for the swell coming the following week. This meant about six lay days between the two swells. It wasn't too tough to occupy ourselves for six days. We fished, dove, played basketball and repeated. The next swell showed up and brought Donavon Frankenreiter with it. Talk about a dynamic individual. Equipped with all new Martin guitars for locals, he arrived like the rockstar that he is. We partied, played music, drank kava and best of all – surfed. The vibes were mellow this week. No one was waxing up 9'0's and filling their vests with CO2 cartridges, but rather playing ping pong and skating the mini-ramp. Donavon brought a groovy quad shaped by Hobie and it just looked so cool in the barrel – timeless style. The swell got downgraded quite a bit, but Andrew was still ripping. By Saturday, we had been on Tavarua for sixteen days and we were fried. Rashed from head to toe, we were ready to bid farewell to the island that treated us like royalty. I am now back in Santa Barbara and already trying to find a way back to Fiji. This trip wouldn't have been possible without Andrew and the kind folks at sundancebeach.com. I am truly grateful he let me tag along to witness some of the best surfing I have ever seen. Vinaka vakalevu.